It seems virtually impossible to avoid negative news on TV and even our social media feeds. With the bombardment of such negativity it is easy to fall in a cycle of hopelessness for humanity. I strive to practice gratitude daily, so that even in these dark times I am reminded of the good. While not ignoring the challenges that we must work to overcome, this post highlights 5 particular acts of kindness from people that could have easily avoided involvement, yet chose to help me, a much appreciative stranger get through many unfortunate situations while traveling. 1. Third Time's the Charm. During grad school, I spent one spring break traveling Europe with a guy I was dating at the time. The trip was initially suppose to be 12 days exploring Venice and different cities in Austria. But, ultimately it was shortened to a 10 day trip because getting there was rough! My flight to Munich flying from Raleigh, NC was cancelled twice. It was rescheduled for a 6am flight the next morning. At 4am the airport was already crowded due to all the canceled flights the previous night. Like I often do when I'm traveling alone, I engage in conversations with strangers. In line ahead of me, stood 4 members of Hillsong Church who were traveling to Ethiopia for a mission trip. I talked to the Pastor for about 30 minutes while standing in line before we reached an agent. By that time, the prompter said that the flight was cancelled. We were all heading to DC to catch our international connecting flights. I overheard them talking about driving to DC. I said a quick prayer in my head asking for guidance and took a leap of faith and asked the Pastor if I could join them for the ride and contribute gas money. Despite their connection flight in DC being at a much later time than mine, they rented a car ASAP to make sure I could make my flight and didn't accept my gas money! 2. Kiss from a Rose. 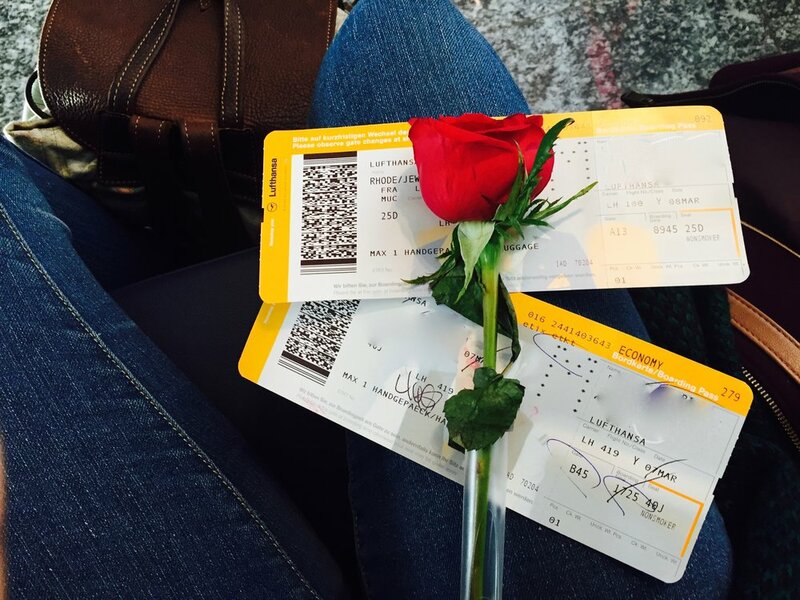 I made my Lufthansa Airline flight from DC to Frankfurt and while walking out the flight attendant randomly handed me a rose! It was just the sort of comfort I needed after such a tumultuous journey. I knew it was another way of God telling me, "Hey I'm still here!" Two cancelled flights, a 5 hour drive to DC, and two connecting flights later I was finally in Munich! Arriving two days late drastically shifted our itinerary. Initially we were supposed to spend some time in Kufstein, Austria before we drove to Venice. But due to the delays, we had to drive 5.5 hours to go directly to Venice. Anyone who has been to Venice will tell you it is a maze! We arrived at night and had trouble locating our hotel. We were tired (I was borderline delusional) and extremely lost; walking around for about 45 minutes. We came across an American man who was on his way back to his hotel, who spent another 20 minutes with us to help us find our hotel room. 4. We Gon' Save that Money. On a separate trip to Europe with my best friends, while in Amsterdam, my friend unknowingly received a ripped 50 euro while dining. We were searching for a place to replace it with a non-torn bill. We went to two banks that didn't exchange it. I randomly stopped a man on the street to ask if he knew where we could exchange this torn bill, and he said no, but gave us the freshest 50 euro bill! We offered him the ripped bill, but he didn't accept it. The best part was he didn't even want our numbers or expect a service in return! 5. I Keep on Falling. During winter break of my last year in graduate school I took a trip throughout Southeast Asia. While in Krabi, Thailand I fell off of an ATV in a little ditch and it landed on my leg. My adrenaline gave me some super human strength because I was able to push the ATV off of my leg. I had a little puncture wound that we cleaned up immediately, and with the help of great friends to literally lean on, I was able to walk. We ended our trip in Bangkok where I spent two days on bed rest with my leg elevated and iced. On the way back to the U.S. we had a overnight layover in London. At that time I thought I was healing properly; however, I realized during my flight that my ankle was badly swollen and turned black and blue. While in a London Tube station, I was clearly distraught and crying, and so many strangers came up to me to ask what was wrong and give me advice on where to go. One of my friends helped me get to an urgent care where I received x-rays, and a blood thinner shot free of charge. Thanks single-payer insurance system! These are just a few of the many acts of kindness I've been on the receiving end for while traveling. I'm so grateful for each of these people because they serve as a much needed reminder of the goodness that is left in the world. They are the light in a world that can seem very dark. It is this kind of light that I inspire to be in the spaces I occupy globally. Have you experience kind acts from strangers while traveling? Let me know in my comments.